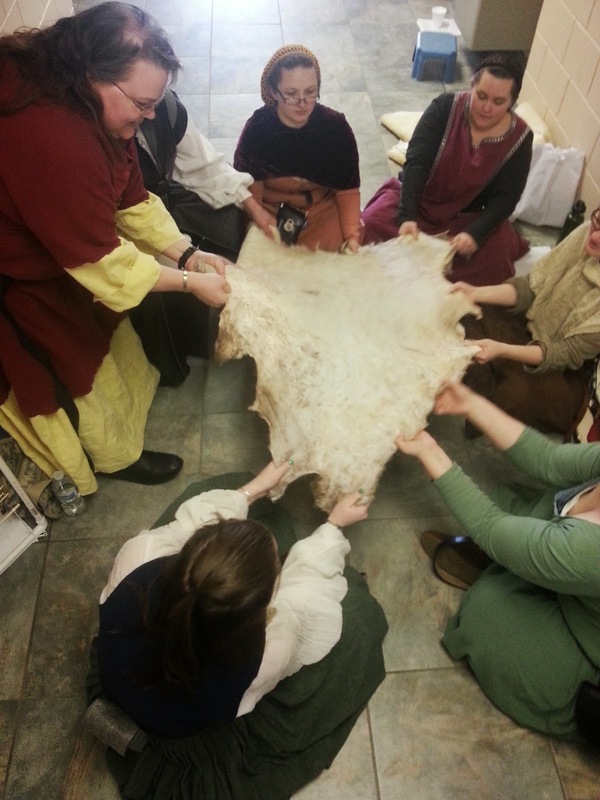 The other class I taught at Northwoods Community College was about tanning (tawing) my first deer hide. I threw together the notes from the main website I used, along with links to other sources I'd found. This was very much a "learn my mistakes along with me" class. Before I get to how the class went, I need to go over all the steps leading up to it. For the first leg of this journey, read Tanning a Deer Hide: Part 1. I'm mostly following the steps from this forum post. In part 1, I had reached step 4: the last step in applying the chemicals to the hide. Now, it's all about cleaning, drying, and stretching. And here's a couple pictures of the wet hide in my bathtub, right after wringing most of the pickle out of it and giving it a quick wash with laundry detergent. The forum post tells me step 6 is to go over the hide and try to peel off any remaining membrane. At this stage, I just couldn't tell what the membrane actually was, so I wasn't able to do this very well. On another site, I read that you want the fur side to be dry, and the skin side to be damp but not wet (cool to the touch), before the hide really starts getting stretched. 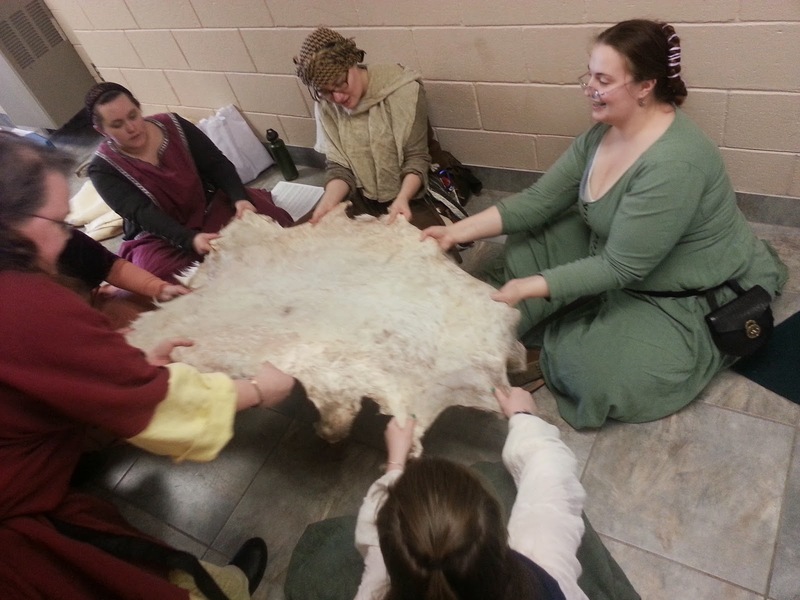 So in order to dry the fur side, I laid the hide out, skin-side-down, on a table, and applied fans to it. I fluffed the hide up with a fork, and then actually used my cat brush on it, which worked pretty well. I kept getting a lot of hair out of the hide. Also, the fur side is still kind of salty - I wish I had washed it more thoroughly, but I was worried about rinsing out the pickle. Other articles say that they rinse their furs pretty thoroughly after taking them out of the pickle and that it's fine. Next time, I would definitely take some more time to really work at the fur side and get more salt out of the hide. As the hide dried, most of the underside stayed good and damp. The edges, though, started to stiffen, as you can see in the picture below. You can see the color change from the dry (white) part to the damp (grey) part. To mitigate this, I tucked the problem edges underneath, and continued to dry the fur side. It took about two full days with fans blowing on the fur for it to dry. My class was mostly about following step seven of the tawing process, and talking through what I had learned. Seven: The hide should be almost but not quite dry for this stage- if it has been in a frame and gone board-like, lightly spray it with water to allow you to work it. You need to start stretching the hide. If its on a frame use a rounded stick or a wooden spoon and lean into the hide, pushing the leather against the tension provided by the frame to stretch and manipulate the leather. If you are doing this without a frame, get a few friends to help and play tug of war with the hide, try sitting with your feet touching and hold an edge each then stretch and pull. You'll know its working because the stiff, greyish surface will become softer and whiter and often considerably bigger. This can be very strenuous! As the class went on, I learned more and more about the mistakes I had made, and how I would do it differently next time. First off, the notes are correct: stretching the hides by hand is very, very strenuous, hard on your hands, and takes many hours. We stretched and worked the hide for about an hour, and it was barely changed. Not only that, but once the hide dried (a few of the edge pieces were dry), I could tell that I had gotten none of that membrane off of the hide when I scraped it - it was fairly easy to tell and peel up some of it (pictures in the next post). Peeling the hide at this stage is not something I would recommend doing - it takes many, many hours of gripping and peeling off tiny pieces, because it does not just come off in a big sheet. The day before I taught this class, I found a video of someone scraping a hide. This enhanced my understanding of this like no words on a page could, because he actually showed what the membrane will look like as you're scraping the hide. Also, if (probably when, who am I kidding) I do this again, I will almost certainly be getting a fleshing knife, and building myself a simple frame to stretch this hide on. I can't imagine what I would have to do to bribe friends into stretching a hide for the many strenuous hours it would take to do this properly without a frame. In order to keep the hide damp while transporting it (from home to class, and then back home, and then for several days while my mother visited), I kept it in a plastic garbage bag. It worked really well.